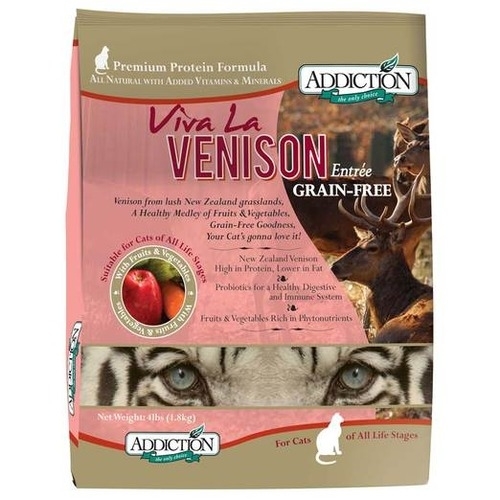 Viva La Venison dry cat food by Addiction features free range venison from New Zealand. 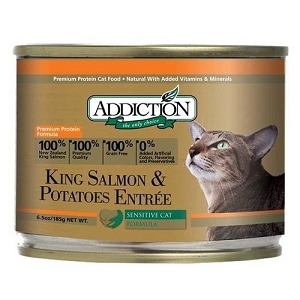 This mouthwatering treat is something that any cat will enjoy. The food features fruits and vegetables as well as probiotics that will provide your cat with a healthy and vital lifestyle. 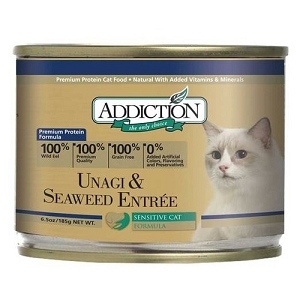 It is made without grains, which makes this food a wholesome meal for your cat during any of its life stages. 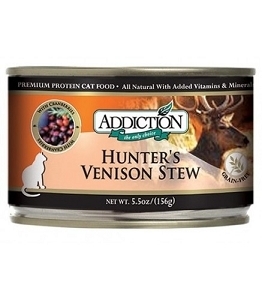 Low in fat and highly digestible, Venison has a full flavor that cats simply love. It is also lower in cholesterol and fat than most cuts of meat, making it an ideal protein for optimal well-being and vitality. Free-Range New Zealand Venison is raised in the lush grasslands of New Zealand and is free from artificial hormones and steroids. Beneficial bacteria known as Probiotics have long been useful in optimizing digestive processes and allowing maximum nutritional benefit from food. Probiotics support a healthy digestive tract and immune system.